TPP have been working on the Houghton Regis urban extension project since 2006 and Central Bedfordshire Council (CBC) resolved to grant outline planning permission in September 2013 subject to referral to the Secretary of State. 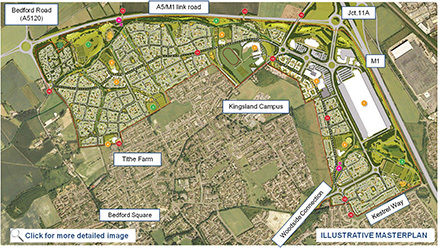 The 262-hectare site is located to the north of Houghton Regis and Dunstable and the approved development will create a sustainable community of up to 5,150 new homes with 202,500m² of additional development including retail, employment, leisure, community and education facilities. The urban extension will also help to deliver the A5-M1 Link Road, the new M1 J11A and the Woodside Link, which will bring benefits to the wider area including helping to relieve traffic congestion in the nearby town centres. TPP has carried out extensive transport work as part of the team that secured outline planning consent. This has included assisting with the Illustrative Masterplan to create walkable neighbourhoods, producing the Transport Assessment, transport work for the Environmental Statement, liaising with the local councils and the Highways Agency, undertaking walking and cycling audits and producing a bus strategy for the development. Work is currently ongoing on the next stages of the development including the Framework Travel Plan. The client for the project is the Houghton Regis Development Consortium that includes leading partners AXA Real Estate Management and Lands Improvement Holdings.